In reality, my professor said, “Are you guys excited to LARP? !” For the uninformed peasants, LARP stands for Live Action Role Playing and was probably invented by Dungeons and Dragons players who tried coke for the first time. Basically what happens is a bunch of 30 year-old white men dress up as mystical creatures like Gandalf or Pinkie Pie from my Little Pony and run around in the middle of a field. Except in this context, it would be a bunch of faux-hipster college students running around in costumes and Doc Martens around Noyes Circle. Tongue in cheek aside, I do hope that the class gets a lot out of my presentation and playing Archaea itself. I video chatted with the class to help them get their characters set up and to answer any questions they had. They seem a bit reticent, nervous, weirded out by having to run around outside. Like students in my LARP classes, all it will take is for them to just start playing for the worries to melt away. It happens every time. The idea that games are inscribed by a magic circle of play is not new, beginning with philosopher Johan Huizinga describing in Homo Ludens the notion that play is distinct from everyday life, from work, from influences outside of the game. He writes, “Play is not ‘ordinary’ or ‘real’ life. It is rather a stepping out of ‘real’ life into a temporary sphere of activity” (8). For fantasy games, be they tabletop, digital, or live-action games, the magic circle is assumed and often staunchly defended against the “real” world. This presentation challenges the fantasy of the magic circle to reveal the ways game systems, mechanics, worlds, and players never “fail to bring outside knowledge about games and gameplay into their gaming situations…There is no innocent gaming…Players also have real lives, with real commitments, expectations, hopes, and desires [that are] brought into the game world” (Consalvo 415). In particular, given the performative, embodied, and interactive nature of live-action role-playing games or LARPs, how might we unpack the fantasy of fantasy’s magic circle, which often serves to reinforce, even obscure norms about race, gender, sexuality, class, and bodies? If fantasy games are, as Gary Alan Fine argues, “constrained by the social expectations of players and of their world,” then how might we challenge larping’s normativities, and more importantly, use the affordances and limitations of LARP in order to imagine and articulate alternative, just, inclusive, even radical modes of play? This presentation includes a workshop and actual play using the live-action role-playing game Archaea. Many thanks to Dorothy Kim, to Vassar College, to the students of ENGL 215 for making this visit (and play) possible. 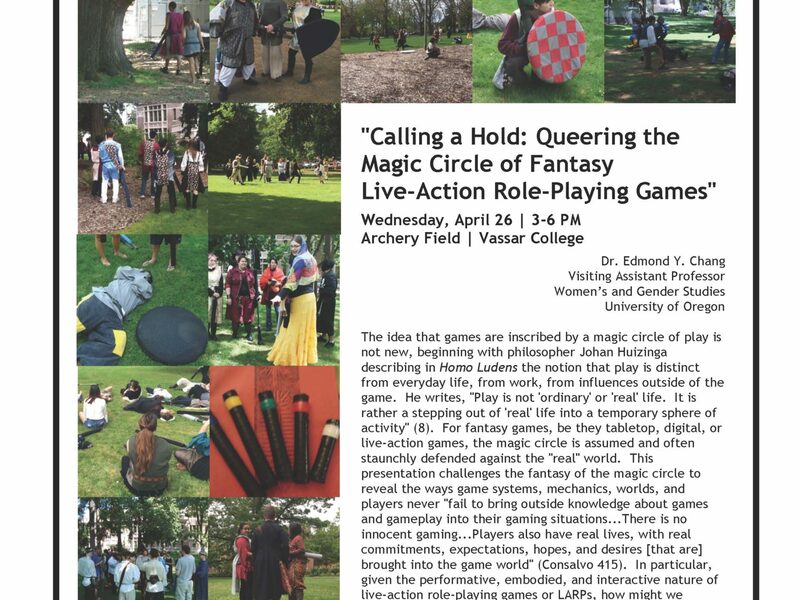 This entry was posted in #fourthyearfaculty, Events, Gaming and tagged Archaea, Dorothy Kim, LARP, Medieval Play, teaching with LARPs, Vassar College. Bookmark the permalink.